Radical-right groups harness online platforms to disseminate dogmas against the ‘Other’. In response to an influx of foreign migrants, the concatenation of Islamist terrorism and record levels of distrust in government institutions, the radical-right is invigorated by an aggressive anti-‘Other’ sentiment. As the source of social anxiety and cultural disintegration, the ‘Other’, also referred to as ‘folk devils’, are deemed responsible for edging society towards criminality and national collapse. Using online webs of interconnectivity and shared ideological nexus points, the radical-right community mobilise fear and popularise hatred in opposition. From the cacophonic walls of private online chatrooms, the radical-right are emerging into the mainstream to converge in discriminatory conversation against ‘Other’ identities. While anti-‘Other’ dialogue thrives online, it has transcended the online domain and is embodied by ‘alt-right’ entrepreneurs and reactionary right-wing political popularists. Such leadership has emboldened right-wing malefactors to publicly vilify ‘criminal-prone’ foreigners, and denunciate pro-multi-cultural politicians. Subsequently, in an online-offline dialectic, these public acts draw observers back to extreme-right online depictions of the ‘Other’. According to the far-right, one disrupts the socio-cultural hierarchy, while the other betrays national interest in favour of multi-culturalism i.e. the ‘Other’. This has normalised the use of intolerance, hostility and violence, as necessary means of securing societal well-being and preserving cultural prowess. Consequently, this anti-‘Other’ dogma and the online-offline dialectic, has accommodated the proliferation of small, anti-Islamic, ultra-nationalistic extreme-right groups. And Australia is no exception. Like its North American and European counterparts, the Australian new-right movement has been characterised by contemporary Islamophobia and imaginative methods of attracting online support. Within the Australian far-right campaign against Islam, the new-extreme-right are seen to be innovative, interconnected and internationally supported. Australian new-right groups ‘Rise-Up Australia’, ‘Reclaim Australia’ and ‘United Patriots Front’, instrumentalise liberal values, such as racial diversity, as means of legitimising mono-culturalism and anti-Islamic sentiment. The same groups tactfully coordinate collective demonstrations to socialise supporters. Subsequently, this aids smaller, combative groups like ‘True Blue Crew’ and ‘Patriot Blue’ through association. Together with their efforts to manipulate the Australian mass-media, new-right groups mutually bolster their online profiles and potentiality for mobilisation. The Australian extreme-right’s animosity toward Islam is validated by domestic far-right political parties, and a series of internationalalt-rightentrepreneurs and provocateurs. Not only do visits from international alt-right figures rally Australian extreme-right groups, it cross-pollinates supporters and reciprocally broadens their online demographic. While these methods of attraction are visible at the street level, new-right social media support reveals a similar trend. To emphasise the effectiveness of the Australian new-right’s allure over time, a historical statistical analysis was utilised to represent fluctuations in Australian new-right Facebook followers between January 2016 – July 2018 (Figure.1). Built upon previously collected statistical data by Geoff Dean and colleagues (2016), a trending increase in followers across new-right Facebook pages is salient. Although some groups have experienced a significant increase in followers, such as Reclaim Australia (+41.8%), Australian Liberty Alliance (+60.5%), Nationalist Alternative Australia (+68.5%) and Sovereign Citizens (presently represented as the United Rights Australia Facebook page) (+20%). The United Patriots Front has experienced a significant decrease (-192.4%). The United Patriot Front’s contrast to the general trend in online followers is a consequence of their removal from Facebook in May 2017. The group was removed from the popular social media site for an inflammatory and discriminatory video, which depicted the decapitation of a Muslim effigy. The leader of the United Patriots Front, Blake Cottrell, was subsequently charged under Victoria’s Racial and Religious Tolerance Act, for inciting ‘serious contempt against Muslims’. Before Facebook’s opprobrium and Cottrell’s re-introduction with Australian courts however, the United Patriots Front had once accumulated approximately 120,000 followers. 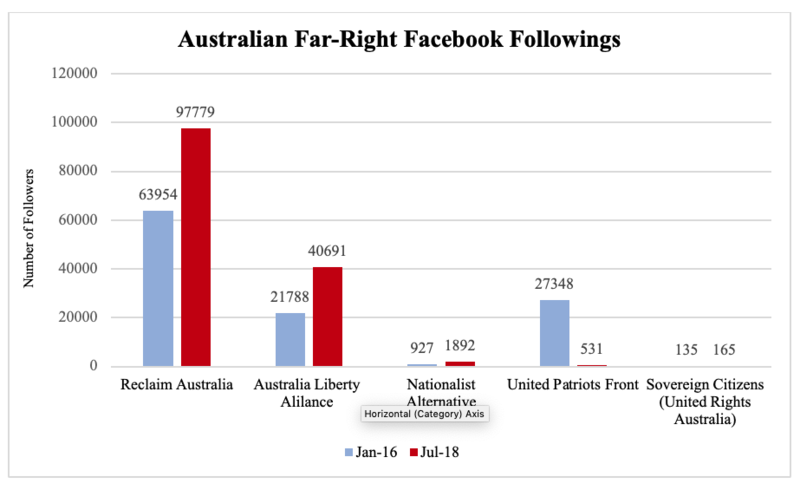 Other notable new-right nativist and extreme-right Facebook pages such as, United Australia (22,233 followers), Soldiers of Odin Australia (21,344 followers) and True Blue Crew (11,966 followers), have rapidly accumulated online followings. Expansive online followings enable extreme-right groups to actively take part in the broader movement. While interconnectivity does not equal interoperability, a larger online community could connect the extreme-right to other fragments of the far-right movement. And allow extreme-right groups to converge in anti-‘Other’ conversation, issue notifications, or become notified by anti-‘Other’ propaganda and up-and-coming far-right demonstrations. This is a cause of concern given the new-extreme-right’s recent displays of increasingly violent tendencies during street marches. Figure. 5. This is a statistical representation of Facebook followers from the following far-right groups (from left to right): Reclaim Australia, Australian Liberty Alliance, Nationalist Alternative, United Patriots Front, Sovereign Citizens (United Rights Australia). Conversely, it is speculated that older groups remain clandestine, because they do not seek public acceptance or feel it operationally secure to exist in the public eye. Although Facebook is not the only site that harbours new-right conversations, and the number of online followers does not act as an exact reference for street followers, it does indicate the popularity of far-right ideology and potential for mobilisation in Australia. As Australian new-right groups welcome multiple, multi-racial demographics and international alt-right magnates, dogmatic trends of anti-‘Other’ sentiment is certain to be revitalised. The trend-line of new-right online followings is a sign of their adoption and effective use of online communities to attract supporters. While its full effect on the online-offline dialectic is yet to be discovered, counter-efforts to curve far-right attempts of ‘Otherisation’ intermittently appear at the street-level.